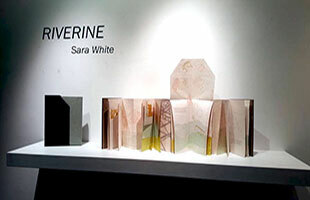 Sara White: "Incorporating themes of community, ecology, and the self, I make books to map experience. I aim to document the interconnectedness between living beings and the environment, while examining manmade constructions and memory. The handmade book becomes a living archive: an object that can be explored, with meaning that changes through individual interaction. 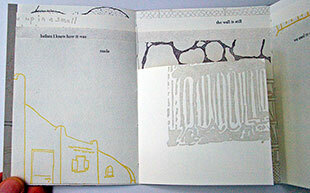 The use of handmade paper, letterpress printing, and hand binding gives materiality and weight to abstract ideas." Tallahassee, Florida: Alluvium Press, 2016. Edition of 35. 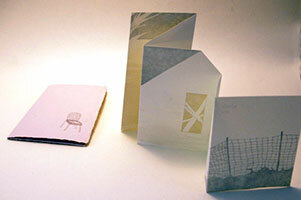 4 x 8"; 6 panel accordion with sewn pamphlets in valleys of 4 folds. Printed 8-color letterpress on handmade cotton/abaca paper. Laid in letterpress printed chemise . Slipcased. Numbered. 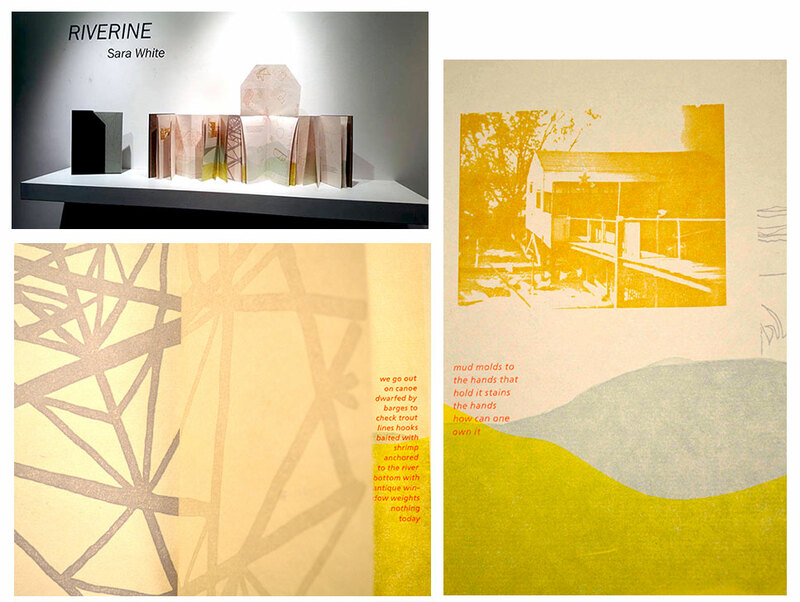 Sara White: "RIVERINE is an artist's book and fragmented essay about a riparian landscape in New Orleans, LA called the 'batture.' Accompanied by letterpress printed imagery and textures of industrial structures and nature that inhabit this landscape located between the man-made levee and Mississippi River along the margins of the city, the book's text shifts and flows with each page-turn. It pays homage to communities that have existed on the batture in homes on stilts throughout history and the liminal experience of living in a place that is neither water nor solid ground, undefinable and always changing." Colophon: "The photographs in this book were originally printed in These Were Our Homes, a pamphlet written and compiled by Elizabeth Cousins Rogers in New Orleans, 1954, in an effort to publicize the unjust destruction of homes along the batture. Much of the information in RIVERINE came from the Batture Dwellers Association Records 1949 to 1958. "This book is dedicated to batture dwellers: to all who live fluidly with awareness and care for the shifting ground beneath our feet." Tuscaloosa, Alabama: Alluvium Press, 2015. Edition of 35. 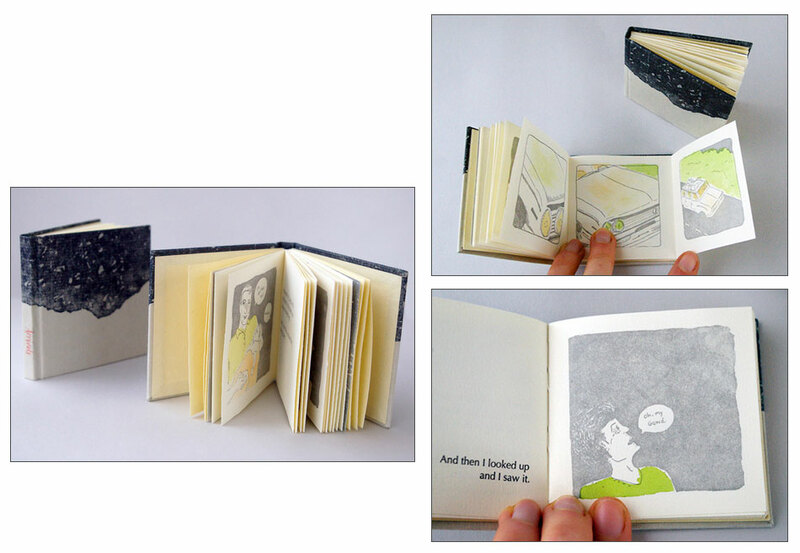 4 x 6"; 18 pages with two double-page spreads folding out. Letterpress printed on Arches Text Wove and handmade linen/hemp cover paper on a Vandercook 3 Proofing Press. 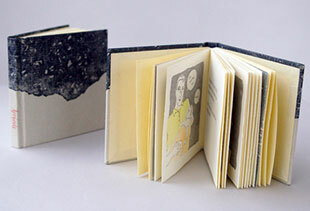 Illustrated with ink drawings, polymer plates and linoleum. Dum leaf binding. Bound in paper over boards with cloth spine. Sara White: "MISS addresses the industrialization of the Mississippi River Valley from an ecofeminist perspective. The drum-leaf binding resembles a field notebook to mimic those used by engineers in the early twentieth century. I used the book Riparian Lands of the Mississippi River (1901) as my source text and drew ink-wash illustrations from a few of its photographs and diagrams, which were scanned and letterpress printed using photopolymer. I created an erasure poem after extracting all passages that use the pronouns her and she from a pdf of the book. The authors only use these words to describe structures, cities, or nature in this book of essays championing river industry in the South. I used my own handwriting to create a new narrative about her, which is intended to parallel the control and oppression of the landscape to that of the female body/voice." Tuscaloosa, Alabama: Southern Pests Books and Prints, 2015. Edition of 45. 4.5 x 7.25"; 40 pages. 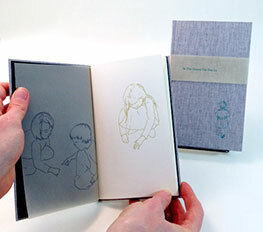 Letterpress printed the book on Mohawk Superfine paper with Hahnemuhle Ingres and transparent vellum end-sheets. 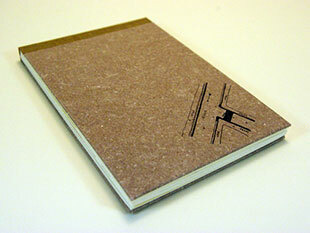 Letterpress-printed case binding covered in full-cloth. Band closure with printed title. Signed by the poet. Numbered. Sara White: "This book is a collaboration between myself and New Orleans poet Anya Groner. I was first introduced to Anya's poetry when I heard her read at an event hosted by an independent bookstore where I was working in New Orleans in 2012. I was so enchanted that I proposed we create a book, and about a year later this flat-back hardcover edition of So Our Ghosts.. was born. 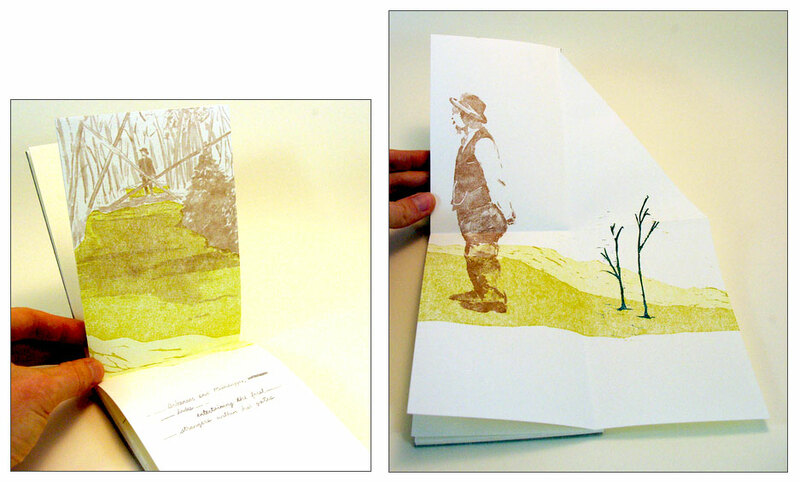 I created illustrations to accompany her poetry and letterpress printed the book on Mohawk Superfine paper with Hahnemühle Ingres and transparent vellum end-sheets. Anya's poems have been published additionally by Umbrella: A Journal of Poetry and Kindred Prose, Story South, Word Riot, 751 Magazine, Women's Studies Quarterly, Juked, Country Dog Review, Pank, Everyday Genius, The Volta, Catamaran Literary Reader, Weave, and The Pinch." Tuscaloosa, Alabama: Southern Pest Prints, 2014. Edition of 95. 4 x 6.5"; 6 panels. Double-sided accordion. Imagery originally drawn in ink then letterpress printed using photopolymer. Enhanced with lightly brushing charred wood, ink and water. Housed in pocket enclosure of handmade paper from cotton bedsheets. Numbered. Sara White: "A Family Attic was created in honor of a house that caught fire in my neighborhood in Alabama in 2014. Its text is an erasure poem extracted from a blurb about the event in the Tuscaloosa News. Imagery of items left at the scene were drawn from memory in ink." Tuscaloosa, Alabama: Southern Pests Books and Prints, 2014. 4 x 5"; 20 pages. 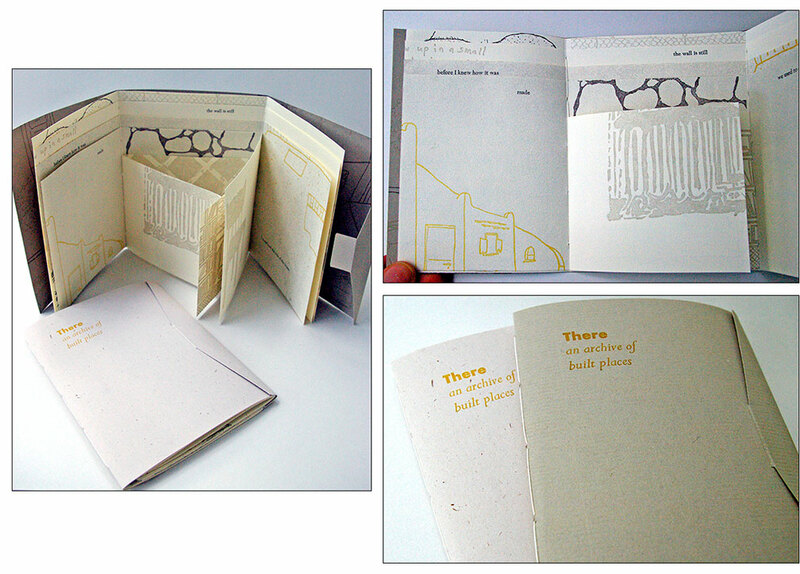 Letterpress-printed gate-fold pamphlet. Handset type. Self-wrap with slip slot closure. Numbered. Sara White: "This book began with an interest in the term 'structure" and its contextual implications for children. 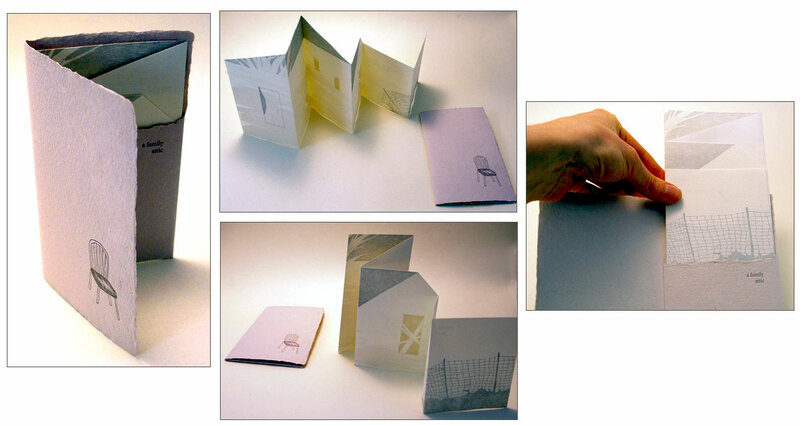 In 2011, I letterpress printed invitations with instructions for participants to draw from memory a human-made structure from childhood on a ready-stamped white postcard that they could detach and drop in the mail. I distributed 100 invitations primarily to strangers around New Orleans, Louisiana, and received about 45 back in the mail. The one-of-a-kind box set contains the original postcards/drawings with a letterpress printed pamphlet that I created by composing a poem from postcard text and imagery. The pages blossom from the center and nestle so that the poem, like memories, may be perceived in multiple ways." Tuscaloosa, Alabama: Southern Pests Books and Prints, 2013. 3 x 3"; 40 pages. Miniature with two foldouts. Letterpress and pochoir printed. Casebound. Numbered and initialed by the artist. Sara White: "I adapted a story commonly told by my late grandma about her experience with a UFO sighting in New York in the sixties. I illustrated her story in a comic-style, first drawing the panels in black ink on Bristol, then formatting the images for letterpress printing. Each panel is lightly pochoir printed with gauche. The book's small size gives it an intimate feeling - the reader can carry this story around in her pocket if she pleases."